This is the second part in a series exploring the relationship between Verdicchio Ristorante | Enoteca with local farmers and producers. We visited two farms recently – Triple Star Acres and Smart Greens Sudbury – to learn about their farming methods and to chat about product availability. Look for their products on our menu. Just a short drive away we arrive at Smart Greens – Sudbury and meet owners and operators Erin Rowe and Stephane Lanteigne. The couple seeks to offer greens like kale, basil and micro-greens year round. The walls inside a vertical farming unit purchased from Modular Farms are lined with organic greens all monitored by a computer system, which also regulates humidity, CO2, air and temperature. The system greatly reduced their environmental footprint, also using less water than traditional farming. Imagine, fresh greens 12 months out of the year! We have all seen how much the price of fruits and vegetables escalate in winter. Remember the $8 you paid for a head of cauliflower in January? Erin and Stephane are Canadian but were living and teaching English in Korea where produce was fresh, readily available, affordable and grown locally. “Through our extensive travels in Asia, the one thing that stood out was the fresh food markets, local farmers and the ability to visit this every morning to pick up our food for the day. That was amazing,” said Erin. At the same time Erin said she would listen to her family and friends back home complain about the cost of fruits and vegetables during the winter months. Meanwhile “we were paying $2 for five fresh mango in the Philippines,” she said. Once the couple decided to move back to Canada to raise their daughter, they began looking into different business ventures. So when Stephane came across Smart Greens, the business seemed to align with the couple’s values and interests. And moving to Chelmsford seemed to fit what they wanted to do. Now located at 3369 Regional Road 15 in Chelmsford, Smart Greens is only the second farm of its kind in Canada. With only a few months into production, the couple is already looking to expand, and add another unit. 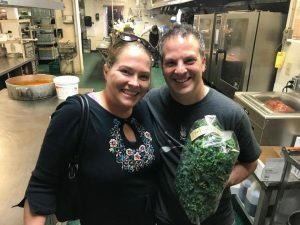 This week Erin dropped off a few bags of kale and an assortment of sprouts – alfalfa, sunflower, arugula and red clover – all grown in their modular farm. We are excited to start offering our customers fresh, locally grown greens! Erin Rowe, owner of Smart Greens Sudbury and Mark Gregorini, managing operator of Verdicchio Ristorante. 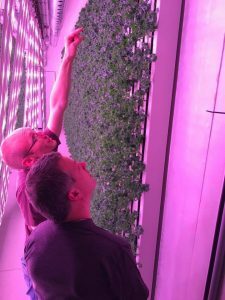 Stephane Lanterne, owner of Smart Greens Sudbury shows Mark Gregorini around the modular farm.